← My First Bubble Wrap! Want to go on Vacation? Not sure if you want to go to a Hotel, Cruise, or an All Inclusive? This book is for anyone who is thinking about going to an all inclusive resort. A great starting place for choosing a vacation destination. Many tips and advice on Things to Think About before Selecting the All-Inclusive Resort, Food, Pool and Ocean, and General Tips. This book also includes: 7 Things You May Forget When Traveling On an Airplane, 28 Things to Know Before Traveling With a Baby, and 6 Steps to Booking Your Dream Cruise- Tips to Save Money on a Cruise. 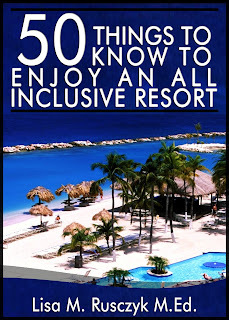 ’50 Things To Know About All Inclusive Resorts’ is an excellent book to help you go away on holiday to the right type of all-inclusive resort for you, your family and friends. The book contains numerous tips to help you select an all-inclusive resort, such as considering the time of year and weather, the facilities available which are of most interest to you, excursions etc, on the foods you would like to eat and the beverages you would like to drink. The book also helps you think about the type of swimming pool you would like to have access to at the all-inclusive resort and also contains general advice for your trip, such as checking in and out and ensuring you have appropriate footwear and sunglasses.